Mama Samantha crossed the rainbow bridge this afternoon. She was born on the 4th of July, 2001, and came from Texas to live with us here in Tucson 2 years ago. 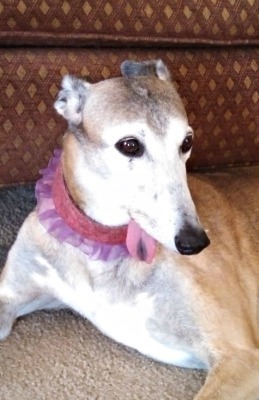 Though she was a brood momma who never saw the track, she could outrun all of our retired career hounds and flaunted her spunky agility regularly. She loved taking her human girl to and from school - creating toofyless drool snart on the window and down the car door. Her favorite things to eat were chiggen, peanut butter, and anything her daddy was making for a sandwich. She had been battling kidney disease for over a year, and it finally took her body away from us. Her life, heart, and soul will remain with us forever. We love you, Mama Sam!! 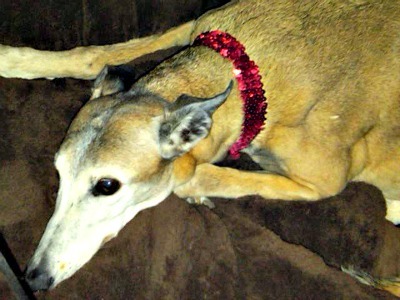 Thank you GALT for giving us the opportunity in adopting this most gracious, sweet senior greyhound gal.